In the first program of its kind, BuzzFeed and MINI created an in-depth video series including 6 co-branded videos, 7 white-label videos, and a short documentary-style white-label video to capture the MTTS spirit. During their journey they partnered with Ace Metrix to evaluate the effectiveness of the creative itself. 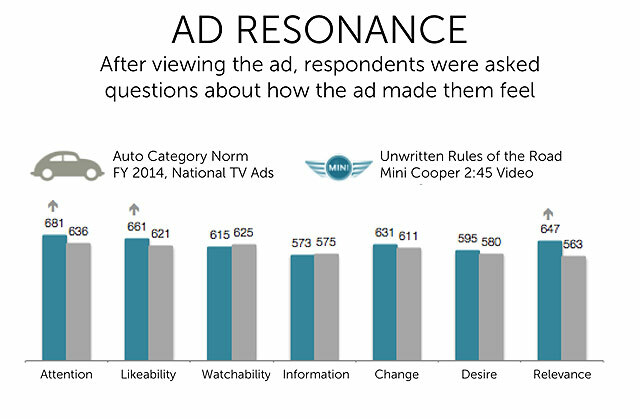 BuzzFeed leveraged our extraordinary normative database to understand how each ad performed as compared to hundreds of other automotive ads that had aired online or on television in 2014. BuzzFeed and MINI were particularly interested in creating an emotional connection with viewers to build brand equity and loyalty. The team was able to identify the demographic strengths of each of the ads and determine which creatives were connecting emotionally with viewers. Here’s a look at a few of the insights BuzzFeed and MINI were able to glean for one of their top performing ads. 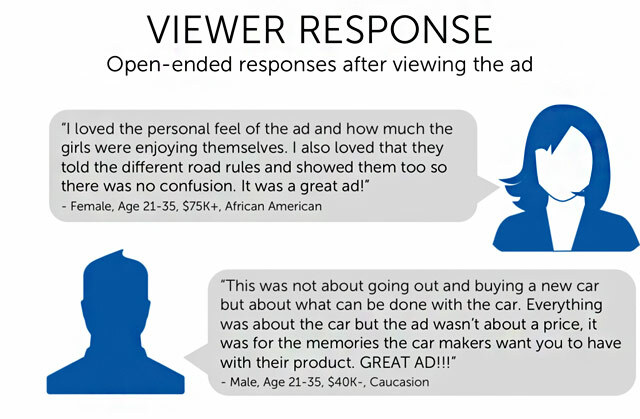 Among all viewers, emotional sentiment towards BuzzFeed native video “The Unwritten Rules of the Road” was 24% higher than the average Non-Luxury Industry Ad– a significant advantage. Specifically, younger viewers between the ages of 21 – 35 rated the ad high for Attention, Likeability, and Relevance compared to all Non-Luxury ads in 2014. The ad especially resonated with younger viewers between the ages of 21-35, who said the elements of the ad they loved the most were its personal feel and the connection the video had to the brand. “The Unwritten Rules of the Road” performed above the Ace Metrix 2014 Auto Industry norm for Breakthrough measures (Attention and Likeability) and Relevance, with the best results coming from viewers who were intending to purchase a vehicle within the next 6 months. The video performed 20% higher than the Ace Metrix Auto norm for driving positive emotional sentiment among all demographics.